e-Preneur surveys, analyzes and makes sense of the entire field of Web 2.0 crowd-power companies. It shows how to succeed as a “crowdpreneur” in the new virtual marketplace by explaining the principles or innovation and revenue models, and the process of going fromm idea to opportunity. Traditionally, crowds seem to conjure up connotations of lowest common denominators, herds of easily led sheep and even posses of angry, torch-toting villagers. Crowds of customers flocking to your business were good, but they were entities to be marketed at, sold to and told what they wanted. However, as the rise of the Internet has begun to reshape our idea of community and move it beyond the confines of the small-town Rotary Club and bowling league, the true power of the crowd and its ability to impact the success of a business has begun to emerge. The rise of Web 2.0 has presented a new frontier where savvy entrepreneurs are beginning to harness the power of the crowd. 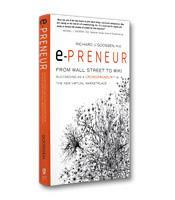 In e-Preneur: From Wall Street to Wiki: Succeeding as a Crowdpreneur™ in the New Virtual Marketplace, Richard J. Goossen presents a first look at this new way of doing business online. e-Preneur: From Wall Street to Wikiexplores the emergence of what Goossen calls the “crowdpreneur”: a business or individual that “uses the strategy of online crowd empowerment in its various forms (collective intelligence, mass collaboration, crowdsourcing and others) in the pursuit of an entrepreneurial venture.” Goossen maintains that it is the crowdpreneur who will be well-positioned for innovation and success in the Web 2.0 world. Goossen also examines the essential components of crowd power, including the principles of collective intelligence, which are based on the idea that the intelligence of the group as a whole is actually higher than the smartest person in the group, and crowdsourcing, where users are given the opportunity to generate content for websites and even to create products for businesses willing to give them a chance. He then explores how the aspiring crowdpreneur can combine the basic principles of entrepreneurship with a focus on generating and utilizing crowd power to achieve innovation and success in the virtual marketplace. With e-Preneur, Goossen provides an entree into the brave new world of crowd power as it relates to the Web 2.0 movement. He includes insightful interviews with emerging leaders in the field as well as in-depth profiles of cutting-edge web-based organizations that have embraced the crowdpreneurial spirit like Cambrian House and Fluevog Shoes. However, for a book that claims it will avoid theory and philosophy in favor of concrete principles, e-Preneur often reads like an academic study of the concept of crowd power. At times, the principles presented seem vague and amorphous, particularly because there seems to be no real-world example available yet to support them. Much of this vagary can be seen as a result of the fact that Goossen is examining a truly uncharted arena, one into which only a few brave souls have taken just the first tentative steps. While reading e-Preneur it is quite possible to see how entrepreneurs in the new Web 2.0 world will find the principles Goossen outlines valuable; however, it remains to be seen just how those principles will develop through actual application as the concept of crowd power develops.